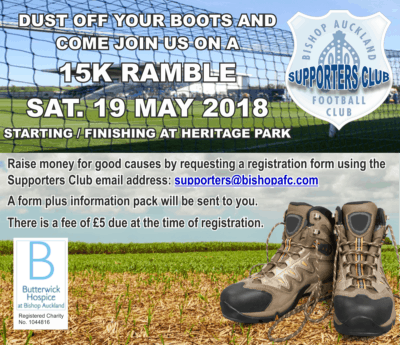 It is arranging a sponsored walk or ramble on Saturday 19th May 2018. 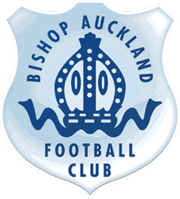 The event will start and finish at Heritage Park, home of Bishop Auckland FC. After the event all walkers will be invited into the Colin Rowell Suite at the ground for refreshments, and as it is FA Cup Final day the football club will be showing the FA Cup Final live on its large screen. The Supporters Club’s adopted charity for 2018 is Butterwick Hospice and we are pleased to tell you that the Hospice will jointly benefit from all monies raised by participants on the walk. We are sure that it will be a great day out for all the family so make sure to apply early. Applying couldn’t be easier, simply register for the 15k ramble by email to: [email protected] and a registration form and information pack will be forwarded to you by post. Alternatively, a pack can be obtained from the bar in the Colin Rowell Suite at any home match-day for the rest of the season or click here to download load them. We look forward to seeing you on 19th May and in the meantime if there are any queries please feel free to contact John Rowell on 01388 600069.